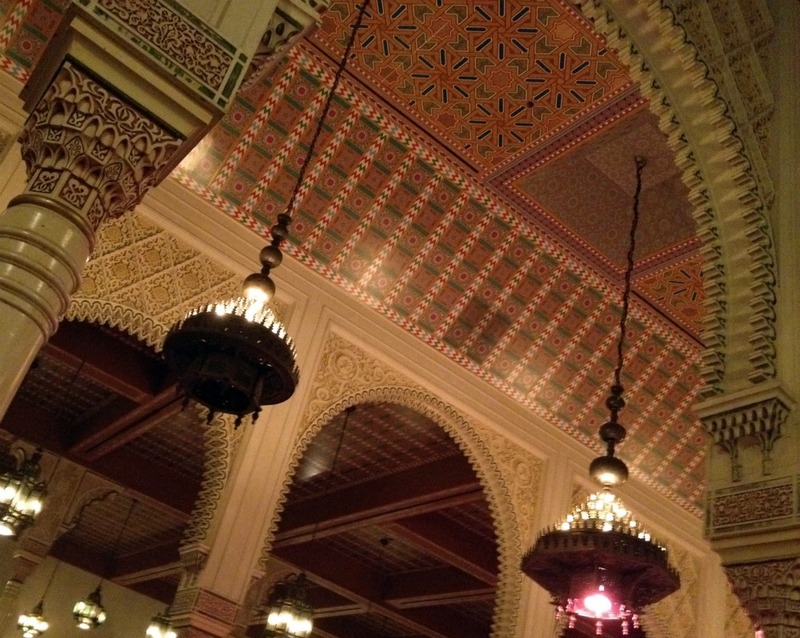 Nestled in the back of the Moroccan pavilion at Epcot’s World Showcase, you’ll find this secluded dining spot. 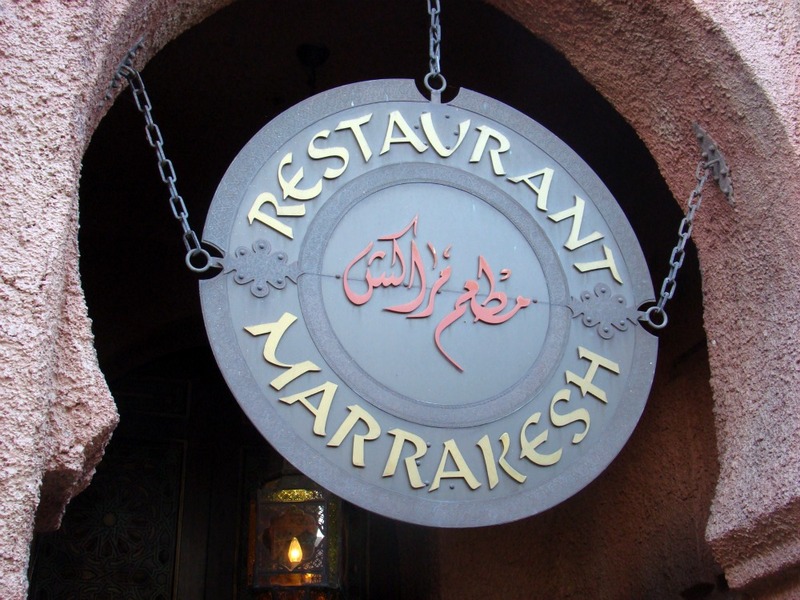 It’s safe to say you’ll encounter some of the most adventurous of eaters here, but I hope some of the more picky palates would venture out of their comfort zones to try the offerings at Restaurant Marrakesh. Finding the restaurant is just the first part of the adventure that awaits you. You need to wind your way through the foreign bazaar of native Fez hats, jewels and fabrics. Take the time to experience all of the culture that you encounter. Back when the pavilion was created in 1984, King Hassan II of Morocco sent his own personal artists, or maalems, to help Disney Imagineers with construction of the project and to preserve its authenticity. 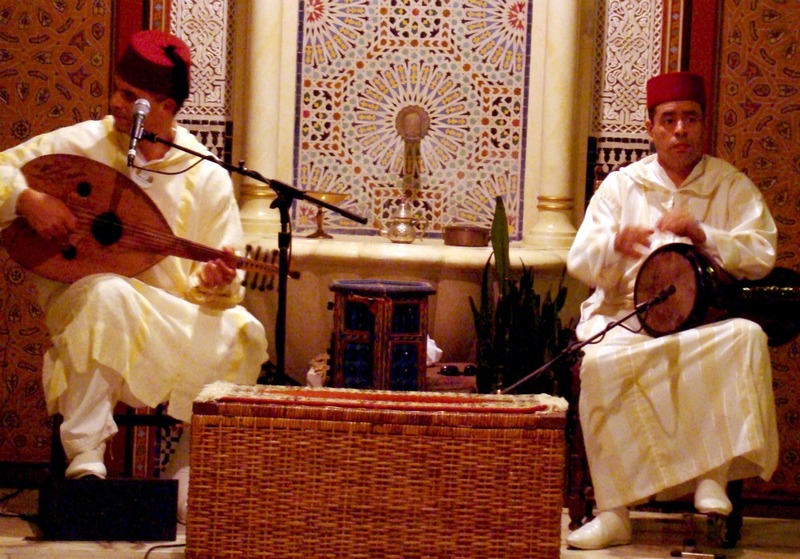 Epcot’s Morocco is based on Casablanca, Marrakesh, Fez and Rabat, and like those cities also has two sections – a new city and old city. As you look at the skyline, the minarets, or prayers towers, are replicas of some from the Moroccan capital. Disney Fact: When you’re in a certain part of World Showcase, the Hollywood Tower of Terror over at Disney’s Hollywood Studios is visible in Morocco’s skyline. Therefore, when it was added to the park in 1994, Imagineers made sure that the top of the hotel would blend in with the minarets so as not to break the visual continuity. 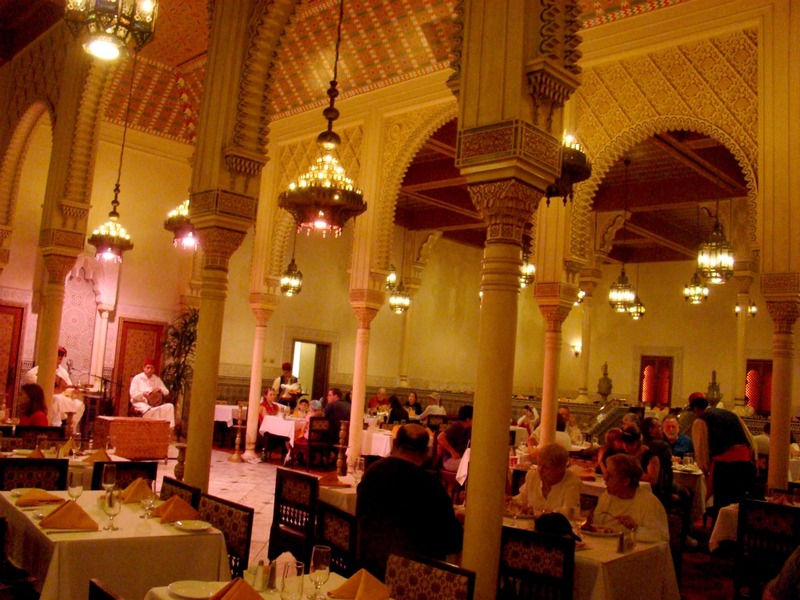 The massive dining room has a towering ceiling with large chandeliers hanging down and intricately tiled walls. 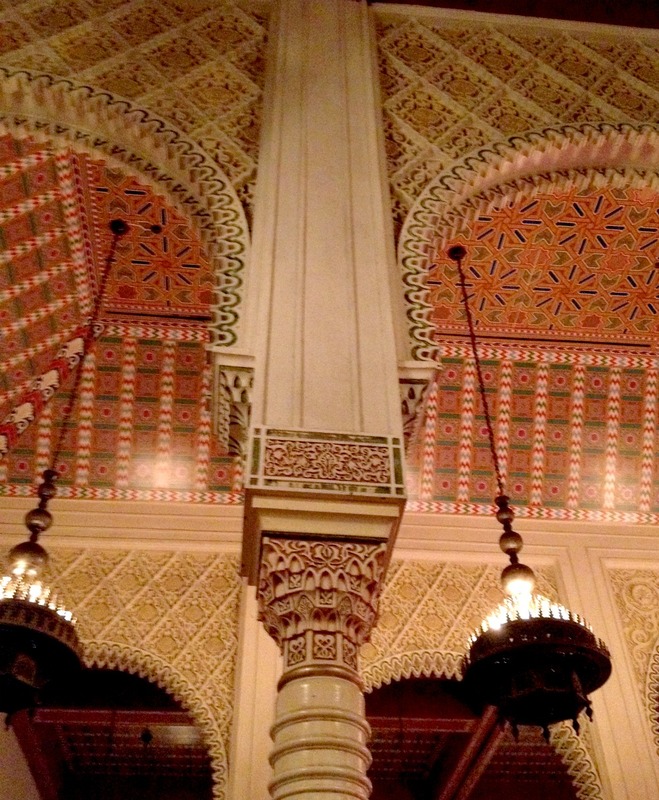 I think I found myself just staring up at the beauty of the ceiling a few times during lunch to admire the impressive handiwork since I highly doubt I’ll ever get to travel to Morocco. We made a last-minute reservation for lunch the morning of our meal. It was quite easy to make it online through the Disney website. As you can see from the picture above, the dining room was far from full. There’s a nice mix of standard tables with chairs, but there also are booths lining the outer rim of the restaurant. Musicians provide traditional entertainment during your meal. We, however, didn’t get to experience the belly dancers on our trip! Now, on to the eats! As I said, we dined for lunch. So, we started off with the Appetizer Combo for Two, which comes with the Jasmina salad (pictured), beef brewat rolls and chicken bastilla (pictured above). The chicken bastilla is a light puff pastry filled with minced chicken, nuts and then sprinkled with cinnamon and sugar. The closest thing I could compare it with would be a cross between baklava and an Indian samosa. Then, the Jasmina salad was a mix of lettuce, tomatoes, cucumber, olives, onion and a light dressing with a lemony feel. Finally, the beef brewat rolls are a very similar concoction to the bastilla but with meat. 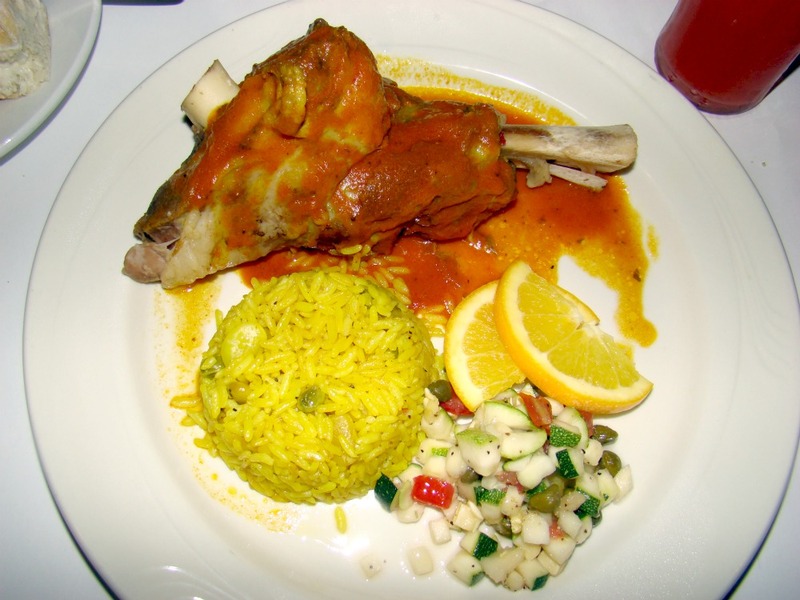 The roasted leg of lamb served with seasoned rice was very tender, but the meat was quite fatty. The sauce, which used the meat’s own juices, was flavorful, not overly spicy but with earthy undertones. There also was a nice little refreshing garnish of a cucumber and onion salad. 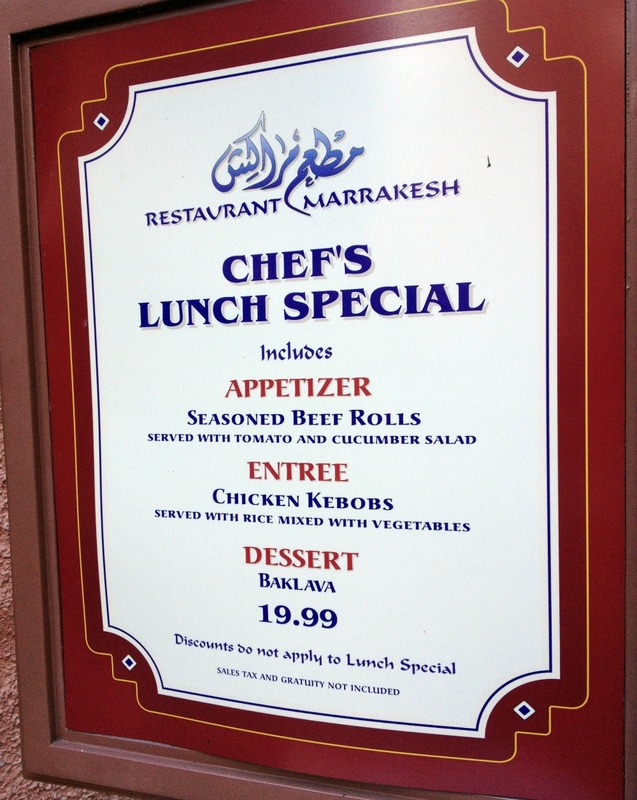 The restaurant offers a lunch special for $19.99 if you’re not so picky, but you get an appetizer, entrée and dessert. 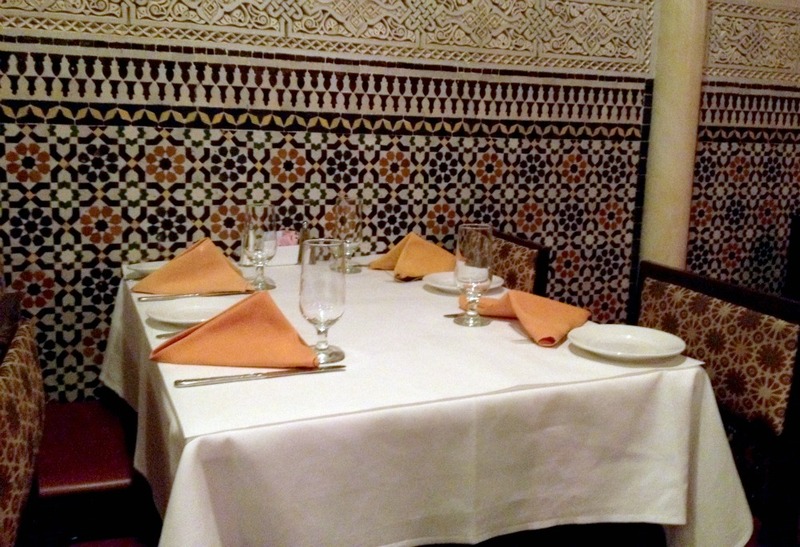 Overall, I found my first experience at Restaurant Marrakesh to be a positive one. 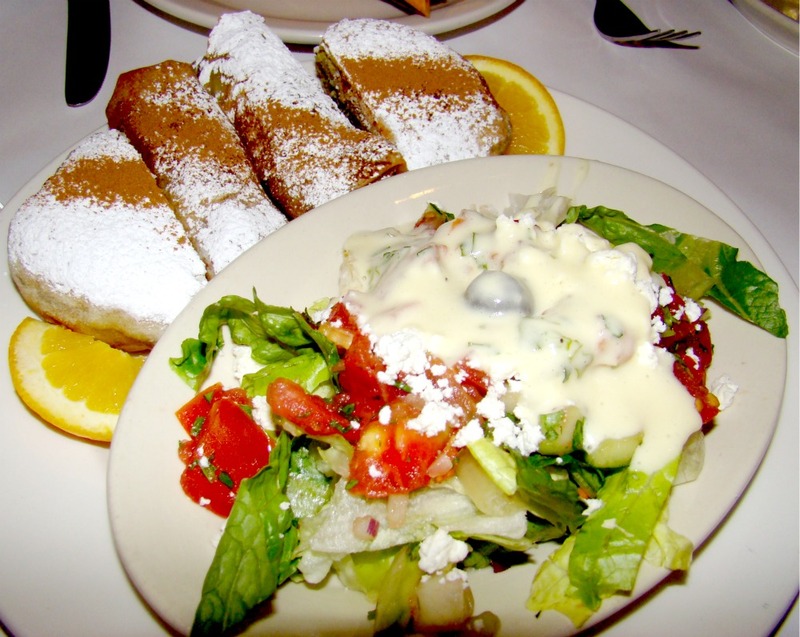 I found the appetizer salad to be very appealing and very similar to some great Greek salads I have had. I think if you’re looking for something off the beaten Disney path or if you’d just like a more quiet, romantic experience, then you can’t go wrong with this restaurant. The menu is also really friendly for vegetarians and is one of the more waist-friendly. Special thanks to “The Imagineering Field Guide to Epcot” by the Disney Imagineers for some of the extra facts about the Morocco Pavilion. It’s a great read! You can find at most bookstores or online. 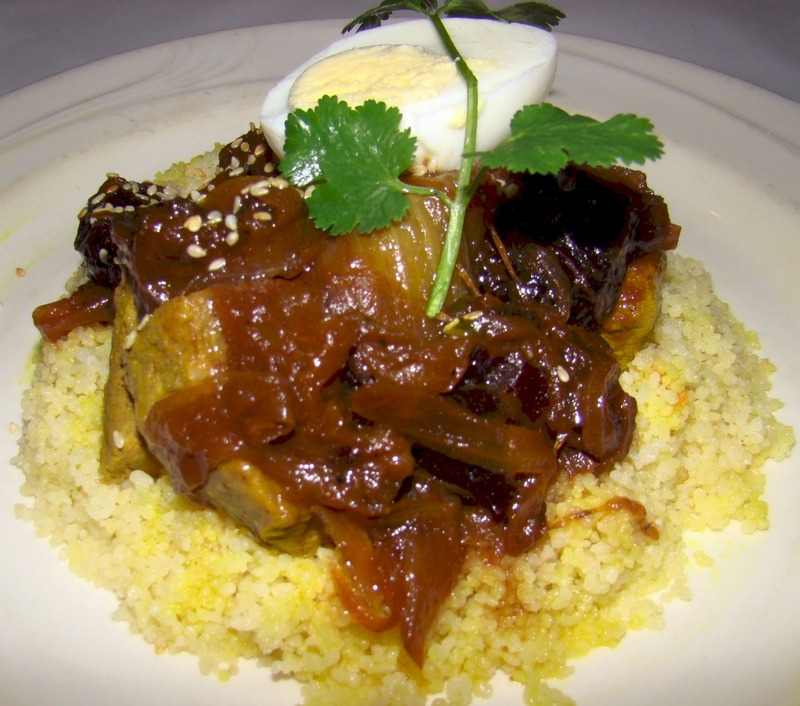 This entry was posted in Disney World, Foodie Firsts and tagged couscous, Epcot, lamb, Morocco, Restaurant Marrakesh, salad, Walt Disney World, World Showcase by Christina. Bookmark the permalink. 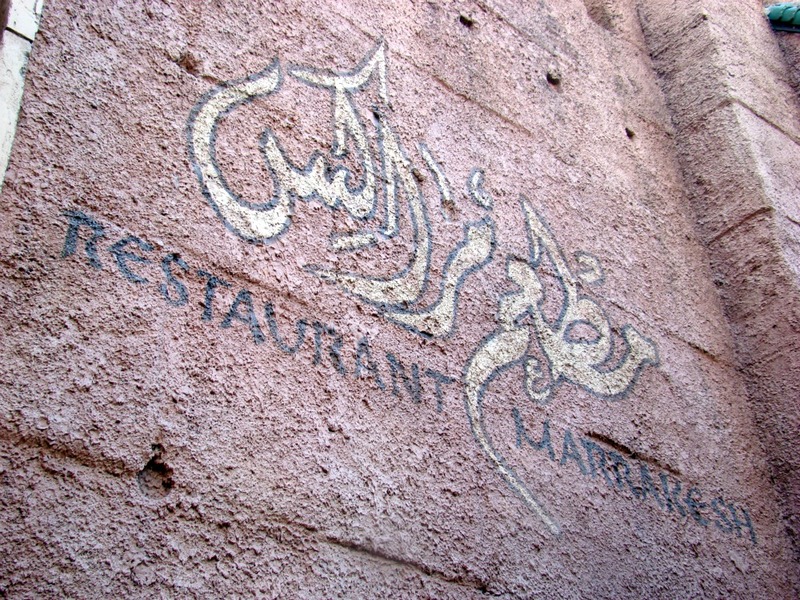 I love Marrakesh, its so peaceful after the busy thoroughfare and the food is so good. Love the jasmina salad and the seafood bastilla! Ooh, I don’t recall seeing a seafood bastilla. That sounds really intriguing. I think it’s just an appetizer now- oh i hope they didn’t do away with it!